Our surveillance solution brings a holistic and cognitive approach to monitoring all employee-related activities with increased efficiency and accuracy and improved regulatory compliance capabilities. It goes beyond traditional rules-based alert detection to proactively monitor employees in real-time including emails, chat transcripts, voice recordings, trade and market data. You can leverage pre-built models and identity new predictive patterns for applications across conduct risk, market abuse and client suitability. Contact a sales rep to get started with transforming your surveillance program. 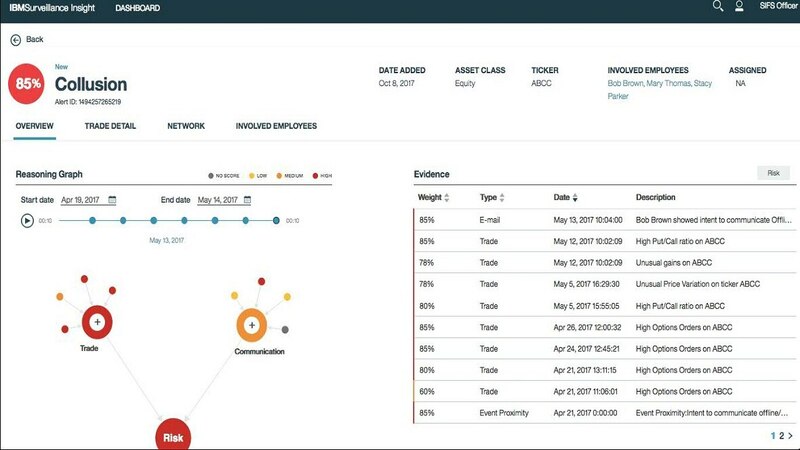 Detect sophisticated misconduct across market abuse scenarios and asset classes by analyzing trade, e-comms, and voice data. Instantly drill-down into the evidence and reasoning behind an alert to make a quick and accurate decision. Know your employees better and proactively monitor them for non-compliance by aggregating and analyzing behavioral data. Reduce false positives and prioritize alerts based on risk by capitalizing leveraging sophisticated, pre-built models. Achieve more accurate trade surveillance spanning across asset classes, markets and market abuse scenarios at lower costs. Effectively capture, aggregate, retain and analyse e-comms data across email, chat and social to achieve holistic surveillance. Unlock voice data from sources such as trade floor communications to accelerate identification of suspicious intent. Uncover sales practice related systemic risks by collecting and analyzing complaints data.